In a quiet cove of Monterey Bay in Northern California, a female raft of sea otters is hanging out in a kelp bed. Time to Eat!! A two-year-old sea otter is starving! She disappears below the surface. Deeper and deeper she goes, looking for her favorite dish. At last! A bed of sea urchins! Sea otters are known to eat 33 different types of prey – but each otter has its favorite 2 or 3, and usually sticks to these preferences its entire life. These favorites are in turn passed on to their young. GASP!! She takes in a big gulp of fresh air – she’d been holding her breath underwater for four minutes!! FOOD!! Quickly spinning the sea urchin in her paws, she breaks off the prickly spines. Using her teeth, she chomps open the body and licks out the insides. The sea otter’s high metabolic rate helps them to stay warm – to fuel it each day, they have to eat 20-30% of their body weight in food! Still hungry, the otter dives below the surface again. This time she comes back with some rock crabs. 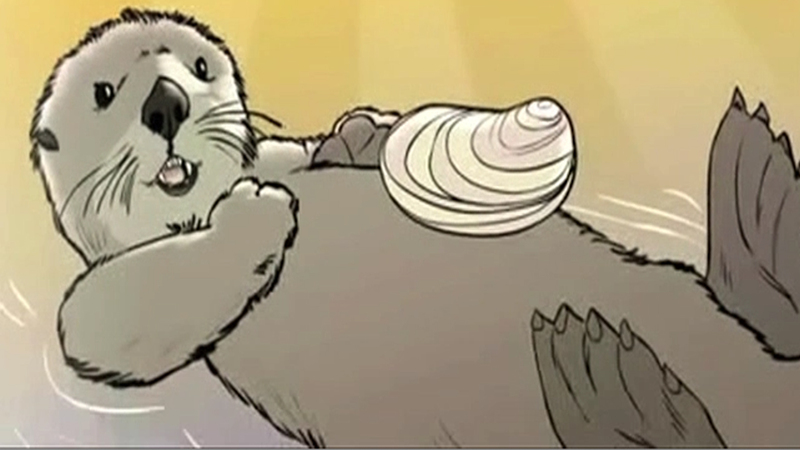 Sea otters are very resourceful – a trait that helps them to survive. So it won’t get away, she wraps one crab in a blade of kelp. That’ll keep it in place while she snacks on the other. Turning over in the water, she rinses the crumbs from her table belly and prepares for her 3rd course – rock oysters! She pulls out a small, flat rock from the pouch under her armpit. Placing the rock on her belly, she produces an oyster. Banging the oyster on the rock repeatedly cracks it open – he rown version of oysters on the half-shell! Time for some fur maintenance! Otters can spend 8 hours a day grooming their fur!! She gets to work untangling knots and cleaning out the outer guard hairs. They protect the inner layer and keep it dry. Rubbing and blowing air into the inner fur keeps it fluffy. Vigorously rolling around, she turns somersaults over and over to move the air bubbles around in her fur. The bubbles trapped inside will insulate her from the cold water. Lying on her back, holding her flippers out of the water to keep them warm, she lays a piece of kelp across her belly and prepares for a nap. The kelp will keep her in place so she doesn’t drift off to sea.